If there is something in common in contemporary ceramics, and also in contemporary art, it is its transversality, fruit of the many aesthetic paths that cross constantly in different directions and without apparent order or tendency. Watching this collective exhibition of recent ceramic art, it is clear that its works have little or nothing in common, which is it most outstanding quality. It is precisely the great diversity and richness of techniques and materials, styles and influences that stands out most of today’s creative ceramics. This exhibition wants to be a sample of what will be the future space of contemporary ceramics of the Ceramics Museum of Argentona, in which we are already working and in which some of the best authors of our country and the world are taking part. 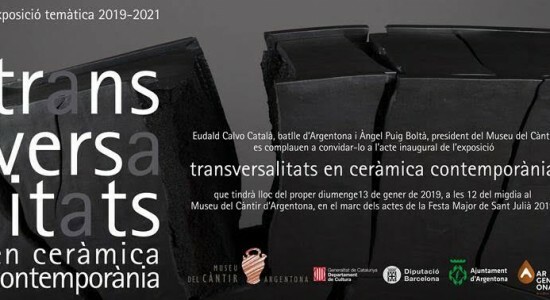 The origin of this collection must be found in the exhibitions made in the museum of Argentona since 1994 and in the works donated to the host country during the 47th Congress of the International Academy of Ceramics held in Barcelona in 2016. The geographical diversity is wide, as evidenced by the fact that about 100 authors participate, mostly from Catalonia, the rest of Spain, but also Europe, America, Australia and Asia. We propose to the visitors that they enter the rich and suggestive world of the forms and textures of the current ceramics, letting themselves be carried away by the emotions and sensations that these creations transmit to them.